So #30daysofclean hasn't been as easy I thought it would be. I've done the strictest form of AIP, and yet I'm struggling with just cleaning up my diet. I chose a rough 30 days to give it a go (but let's be honest, there's never an easy time). I went to New Orleans for a fun day trip and came across an awesome Paleo bakery called FARE: Food For Health. Let's just say it's hard to turn down a cupcake and a brownie when they're gluten-free, soy-free, corn-free, and sugar-free AND I didn't have to bake it myself. Then there was Naked Pizza. Hands down, the best gluten-free pizza I ever had, but it wasn't on the #30daysofclean idea list. So I got de-railed and then unprepared and it's thrown off my schedule. I let it mess me up instead of pushing through. This weekend is my birthday. I'm going to want a cupcake. I can't help it. And I have an awesome Paleo friend, Chrissy, who's offered to bake me a gluten-free, corn-free, soy-free, grain-free, nut-free cupcake. I'm going to eat it. But I'm going to stay on track otherwise. Because I know it's important. And I know that the bazillion pimples on my chin and the painful canker sores in my mouth are from eating too many nuts last week. I could get completely discouraged. Ok, I won't lie. I want to just give up and say it doesn't matter. But the cystic acne lining my jaw and the sores inside my mouth are the reminder of why I'm doing what I'm doing. And I'm going to stay positive. I have learned from this experience even after eating AIP for almost a year. I didn't realize that nuts caused the canker sores and acne, and now I know that it's a good thing that I continue to avoid them. I've also discovered that oil pulling (I use coconut) helps sooth canker sores a lot. If you're not oil pulling, you definitely need to check this out and give it a try! So instead of giving up, I've devoted some extra time into fine-tuning a recipe that I've been working on: a delicious AIP mayo. I've tried other egg-free mayos; there are some really delicious recipes out there from other AIP bloggers like Mickey Trescott's Garlic Mayo and He won't know it Paleo's Creamy Egg-Free Mayo. But I needed something with easy to find ingredients and a great consistency because I'm super picky when it comes to mayo. 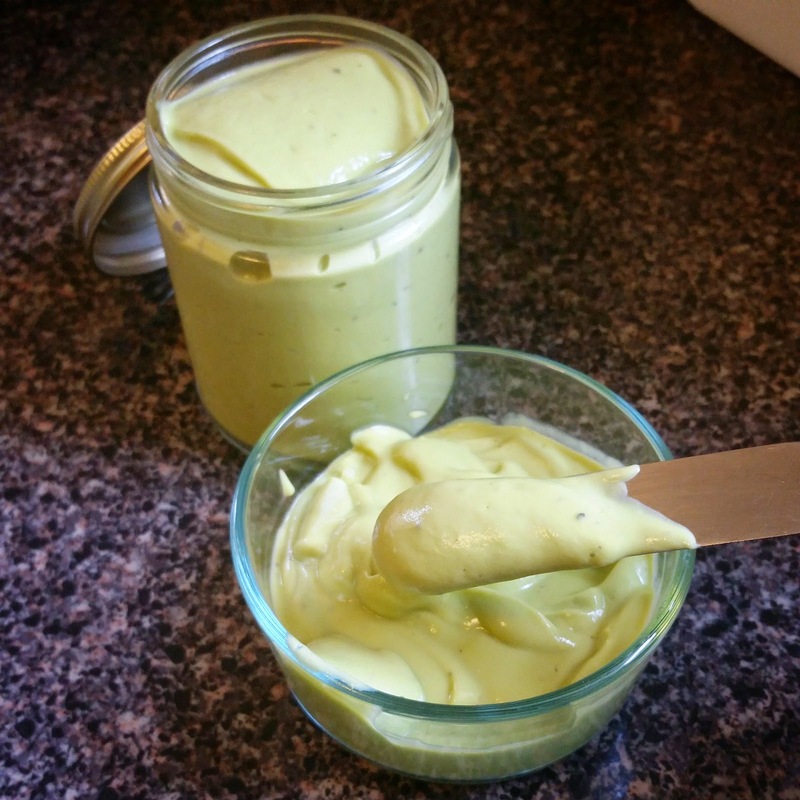 So I came up with this creamy, tangy, and delicious mayo that's egg-free and coconut free (for those of you who aren't having success with coconut). In a tall narrow measuring cup, add all the ingredients and blend up and down with an immersion blender until smooth and creamy. Chill before serving. Makes about 1½ cups. Good in the fridge for a minimum of 2-3 days. This may work in a food processor, but I haven't tried it so I can't make promises. If it does work, or you find another method, please share. I love getting feedback!